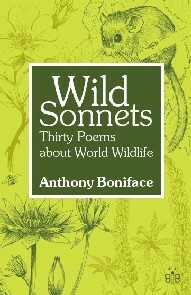 This is Anthony Boniface second collection of poems. This time he wrote thirty nature poems in the form of sonnets, one of the most difficult and challenging of poetic forms to master. It is a poetic safari in search of plants, animals and fungi from around the world... everything from the Ghost Plant of Washington State, USA, the Dead Horse Arum from Manorca, Eleanora s Falcon from Kos, the Mandrake in Crete, Halfmen from the Kalahari in Namibia, Mountain Avens of the Burren of southern Ireland, to the sleepy Dormouse of East Anglia. Each poem is accompanied by a wonderful black and white line drawing by wildlife artist, Janet Blight. These orchids are becoming too inbred. The pollen hangs near the receptive part. A gentle breeze will take the insect’s place. Mass seed production now can quickly start. Flowering once before they disappear. Until their conservation is complete.